The London Garden Bridge: a £200 million proposed pedestrian bridge over the River Thames in London has lost the essential support of the Mayor of London. It was in 1998 that Joanna Lumley first approached the idea of a “floating paradise”, crossing the River Thames as a memorial to Princess Diana. The project had backing from George Osborne and Boris Johnson and was to stretch 366 metres across the Thames, from Temple to the South Bank. It was to have 2,000 plants and 270 trees planted along it in order to create the floating paradise. 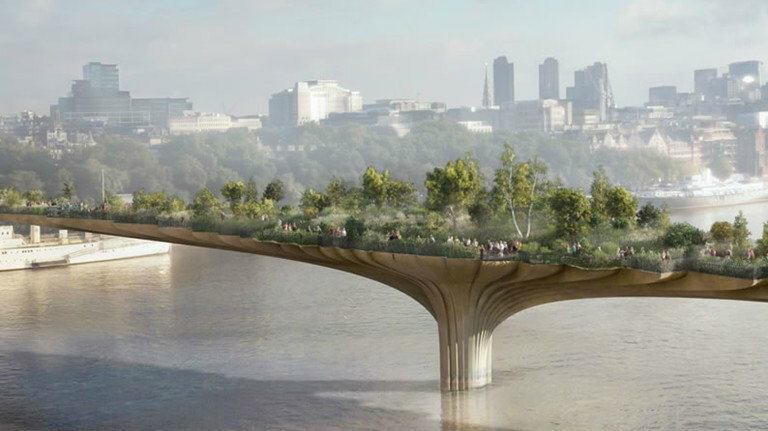 The Garden Bridge was designed by Thomas Heatherwick, after winning a competition. A close friend to both Lumley and Johnson, he first revealed images of his proposal in 2013. The idea was to create an enchanted space in the middle of the busy city, with footpaths weaving through the garden enabling a new pedestrian route. The Mayor of London at the time, Boris Johnson, granted £30 million of public funds to the venture after deciding that there was scope for a new footbridge in central London. But Sadiq Khan, the current Mayor of London, had different ideas. In October 2016 the new Mayor formally appointed Dame Margaret Hodge MP to lead an independent review of the Garden Bridge project. The report was published in April 2017. This was not, however, the first time Khan voiced his concerns regarding the controversial bridge. In July 2016 he suspended construction over funding concerns. The £3 million estimate for annual maintenance prompted this decision as it came to light that the cost would be fulfilled by taxpayers. Controversy has surrounded the Garden Bridge since the beginning. According to Dezeen the project was “called into question by several important individuals over concerns around funding sources and claims the procurement process was unfairly biased towards Heatherwick” something that the head of the Royal Institue of British Architects backed up, believing the project should have been halted in February 2016 due to the winner of the contest being selected unfairly. It appears that Khan putting an end to the construction was the best thing, but what do you think? Would the Garden Bridge have added to London’s iconic skyline? Or are we better without it?